In an effort to make homeownership more accessible, seeing that down payment is often the biggest hurdle, Fannie Mae and Freddie Mac have announced that they will now allow loan-to-value ratios as high as 97%. In other words, prospective home buyers can put down just 3% instead of the previous 5% down payment requirement that was in place for conforming mortgage loans. This should make it a little bit easier to qualify for a mortgage without going through the FHA. Additionally, if you already have a mortgage that is owned by Fannie Mae or Freddie Mac, you’ll be able to get a rate and term refinance up to 97%, as opposed to just 95%, assuming you don’t qualify for HARP. These new guidelines should make conventional loans a lot more popular than FHA loans, the latter of which require 3.5% down and come with very costly insurance premiums. However, there are a few caveats to ensure loose lending doesn’t return just several years after the worst housing crisis in recent memory. For one, both programs require the subject property to be owner-occupied. So investment properties and second homes won’t be eligible. But condos, co-ops, and PUDs are just fine. Additionally, you can only get a fixed-rate mortgage via these new 97% LTV loan programs and the mortgage term is limited to 30 years. Shorter-term fixed mortgages are also permitted. Though Fannie Mae and Freddie Mac are very similar, there are some differences between the two programs that I’ve highlighted below, most importantly the implementation date. So if you were struggling to come up with a down payment, you might now be able to qualify for a mortgage thanks to these new programs. Take a look to see if you’re eligible and then contact banks/brokers to see if they’re available. Most lenders that work with Fannie and Freddie will add these loan programs to their suite of offerings. 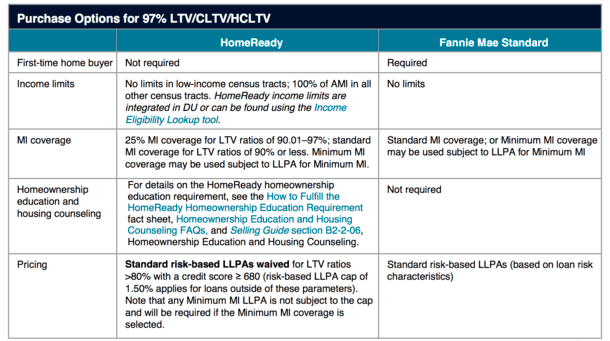 Fannie Mae actually has two separate 97% LTV home loan programs available, one open to everyone and one only for borrowers in low-income census tracts or income-restricted in all other tracts. The income-restricted program is known as “HomeReady” and comes with cheaper mortgage insurance coverage along with lower loan level pricing adjustments (LLPAs). Those lower LLPAs mean borrowers can obtain lower mortgage interest rates, an important benefit for those with affordability concerns. The LLPAs are waived for borrowers with LTVs above 80% and credit scores equal to or greater than 680, and capped at 1.50% for borrowers with attributes outside those parameters. It also allows cash-on-hand as an eligible source of funds, but requires at least one borrower to take an online homeownership education course. For the standard Fannie Mae 97% LTV program, there are no income limits and no discounts in the way of mortgage insurance or LLPAs. And at least one borrower must be a first-time homeowner (no ownership interest in last 3 years). However, no pre-purchase home buyer counseling is required. For the record, there are already individual lenders offering loans with as little as 3% down that aren’t backed by Fannie or Freddie. Examples include TD Bank’s Right Step program and various loan programs via credit unions nationwide. However, the Fannie/Freddie guideline change will allow such loans to become widely available to many more borrowers.